I was at MLA2010 yesterday and participated in a panel discussion of Top Tech Trends (it was good, and if I find the other talks online I'll link to them). The two trends I chose aren't exactly new, but are two things I think will have an impact at the reference desk. They deal with ownership of the resources we offer to the public. This has been a pretty happy segment of the library world for a long time, and libraries probably are familiar and comfortable with subscribing to and offering this kind of content. But in the last couple years, new exclusive deals signed between publishers and database vendors has limited access to many popular periodicals (this also happened last year with Consumer Reports). EBSCO was the focus of much criticism, but Library Journal reports that the publishers are also interested in exclusive contracts. I don't mean to vilify them, because businesses will always act in their own self-interest. But I couldn't tell what bothered me more: loss of access to these periodicals, or corporate press releases [pdf] saying these contracts were in libraries' best interest - there is a difference between "all libraries" and "libraries that are our customers," which is a distinction database vendors don't seem to make. We non-customers can't afford to keep buying more and more subscriptions because these exclusive deals demand it, so our patrons lose out. The bottom line is that it took resources away from many libraries, and I'm sure this isn't the end of it. People might be sick of hearing about ebooks* already. However, since it contains the word "books," there is a natural expectation for libraries to offer them, so you can either jump or be dragged into this discussion. The problematic trend is that the "e" part of ebooks makes them an entirely different animal from print books. Lots of people are trying to figure out how libraries can offer them to patrons, but ebooks have the potential to drastically change the publishing industry (including a power struggle within the distribution chain), and there's no nice model right now that seems to include libraries. Another problem (for libraries) is that the two most talk-about ebooks readers (the Kindle and the iPad) are also the most restrictive. Like publishers and database vendors, Amazon and Apple are companies acting in their own self-interest, and what they're interested in is sales. Their tactic to maximize their sales is to control where the customers can get ebooks - which excludes libraries. At least right now: the same thing was true with the iPod and Overdrive audiobooks - when we initially signed up with Overdrive, they did not work on the iPod (which is what all of our patrons had). Eventually Apple relented, so I'm hopeful they'll also eventually open up the iPad to outside ebook sources. However, there is a case to be made that the iPad is not designed for reading anyway. Ebooks are popular, but right now they only account for 2-5% of overall book sales. That seems small, but library sales are about 4%. Ebook sales will definitely grow, whereas library sales probably will not. Since the future of ebooks will hinge on decisions made by businesses, libraries will need to speak up to make sure we have a role in this market. Something I forgot to mention in my talk also related to the iPad: watching videos online using Flash might be a thing of the past, because the iPad does not support Flash (per Steve Jobs). Instead, the iPad is looking to HTML5, and so is Google. The most obvious impact will be in Flash-based like Youtube and Hulu, but it's worth reading about HTML5 to get an idea of what the web might look like in the next few years. *I don't know if there is an official style guide for these things, but I decided to always spell "ebooks" the same way I spell "email." If it starts a sentence the first letter gets capitalized, but otherwise it's always all in lowercase, as opposed to eBooks, e-books, etc. Speaker: Warren Graham, is a nationally recognized trainer and consultant, with 17 years experience as the Security and Safety Manager for the Public Library of Charlotte and Mecklenburg County. He is the author of Black Belt Librarians: Every Librarian's Real World Guide to a Safer Workplace. Patrons get themselves ejected from the library - the responsibility for acceptable behavior is on the patron. The baseline is that we have rules for library use, people need to follow those rules, or else they can't use the library. Library must have rules (and it should be simple - don't need to have everything written down, ie - don't need a "no prostitution" rule). All you need is a rule that says "No disruptive behavior" and let the activity and behavior - and how it affects other patrons - draw the line. The first one works better - people just need to know the information. It is clear and concise. Rules must have enforcement guidelines. If you don't allow sleeping, how many times do you wake someone up before some consequence kicks in. Do they get five warnings before they're kicked out? No warnings? What if you are kicking out the same patron every day? Do they get banned for six months? Staff must be consistent - and they must be backed-up by library management. We must be consistent in rule enforcement. Patrons need to get the same story and treatment from all staff. If you don't allow something, never allow it. Staff need to understand that safety is up to them - not security staff or cameras - and they need to increase their own environmental awareness. Follow 30-30-30: for the next 30 days, stop every 30 minutes, and look around for 30 seconds. Where are you, what can you see, what is happening? Must have a way to document problems, so trends can be used to justify budgets. Have staff training. And then, hold staff accountable. Have a good relationship with local Police. Make sure they know you have procedures that you follow, and when you call them, you really need them. Also, have contacts at schools, homeless shelters, soup kitchens, and other community services. ...have fewer problems that those that don't. Exercise a prudent caution when you approach people - you cannot judge people by their appearance or the situation. It is smart to keep an obstacle (desk, chair, something) between you and an upset patron. Always maintain personal space (your arm's length is the rule), and you never need to touch someone unless you are defending yourself or a child. Never tell someone "no" and then turn your back. Teens are a different case. How to tell a kid "no"
Am I passive or aggressive by nature? Am I emotional or a thinker by nature? What do you do when a patron tries to pick up a staff person or gives them too much attention? Ask the staff person if they feel comfortable telling the patron they're not interested. If not, the manager must say to the patron, "I know you're not aware you're doing this, but you're making [staff person] uncomfortable, and it's keeping her from doing her job." It is then up to the patron to respond, and it needs to be according to acceptable behavior. At what point do you call the police? If a patron refuses to leave, or is acting erratically. It is up to you to decide how comfortable you are handling the situation. What are some techniques to maintain psychic distance from a patron who is always a problem and just their presence puts staff on edge? The butterflies you feel when you see people like that is a natural fight-or-flight response. When that kicks in, you can tap into mental reserves that you normally don't use. If you can hone in on that extra mental capacity, you will be able to figure what to do in that situation. Do teens always test their limits, and how do you treat them the same as everyone else? Teens acting out are often covering up some feeling of inadequacy, so they do deserve an extra warning or two. But if they turn around and be disruptive or aggressive, they should face the same consequences as anyone else. They can have three warnings, unless they're too disruptive and don't deserve it or you can't afford it. How do you handle kids who scatter to avoid being talked to? You have to find each one of them and talk to them. And when kicking some one out, they should get kicked out for one day, 30 days, six months. Having too many levels of banishment confuses people. What about patrons who deny they've done the behavior? If you know that they've done it, that's good enough for the library. Denial is their tactic to derail you. Another year has passed, which means another round of staff reviews and setting goals for the next fiscal year. Bleh. In contrast to past years, I was encouraged to be brief. So this years goals are a bit more quantifiable, and a bit less "well, that's part of the job description anyway." You know, the way goals should be. Look for ways to better organize and provide access to the library's historical collections, such as the Vertical File, microfilm records, etc. Admittedly, much of this still falls into the "continuing things we're already doing" category, but that is a large part of my job. And something else covered elsewhere in my review is encouraging all staff to attend at least 5 hours of some kind of training or professional development. I think it's all doable. I can probably even manage to squeeze in helping patrons at the reference desk, too. 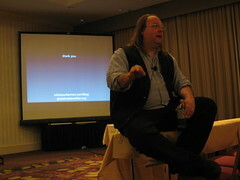 If you ever have a chance to see Ethan Zuckerman speak, do it. Not only is he interesting and entertaining, but his work using technology to bridge cultural divides directly relates to what we do in libraries. He also approaches things from a global "big picture" viewpoint, which is a nice change from my generally myopic "what's going on in my community" point of view. I learned a lot from Ethan, both library-related and otherwise - read the complete notes from his "The Internet is NOT Flat" session. To get guys to come to programs, promote them in places where guys go: the hardware store, the transfer station, etc. Cindy O'Neil, a certified genealogist with the Manchester (NH) City Library, explained the resources she felt were essential for libraries to offer their patrons doing genealogical research. Her handout was a bibliography important genealogy resources, and I tried to include as many of them as possible in my session notes on the NELA conference blog. Definitely worth checking out and comparing to your resources. Of course I got a lot more out of the conference, but these were the things that stuck with me that I wouldn't have gotten if I didn't go. A lot more information on the other sessions are available on the NELA 2008 conference blog. Update: I don't know how I could have left this out: For people wanting a real hands-on demo of how to very quickly improve their library's website, Lichen Rancourt's presentation on how she converted the Manchester (NH) City Library's website from static to Library 2.0 is a must see. Even while working within the City's content management package (which means these changes apply to any website management tool), she brought the real spirit, vibrancy and interactivity of the physical library to the website. The improvements include a flickr badge, a WordPress blog feed for up-to-date news and information, and an events feed.